Cebu Pacific Promo Fares 2019 to 2020: Beach Foot Forward: Piso Fare! Beach Foot Forward: Piso Fare! 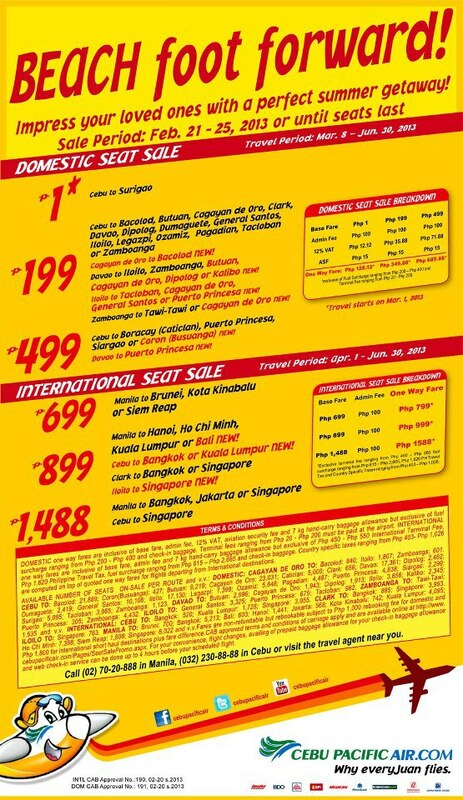 Promo reminder: "Cebu Pacific (CEB) offers P1.00 from Cebu to Surigao!" Impress your loved ones with a summer getaway! Our latest seat sale starts now. Be sure to log on to our website at http://www.cebupacificair.com/ to book your flight now! Please don’t forget to read our seat sale terms and conditions too. Is there any piso fare from manila to CDO? SEAT SALE! Welcoming Year of the Snake!